home / location & lifestyle / blog / test your knowledge with weekly trivia! test your knowledge with weekly trivia! 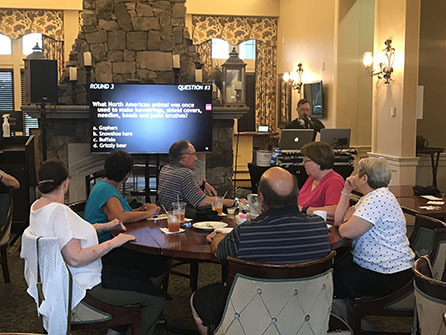 The Forest Restaurant at Cape Fear National Golf Course is home to an assortment of events that Brunswick Forest residents love to take part in, including weekly trivia! Brunswick Forest resident, Laurie Lindsay, tells how this fun-filled event is a great way to meet new people and get involved in the community. With popular and unique categories alike, test your knowledge of music, history, pop culture, animal life, and more! Whether you’re new to the community or have been here for years, trivia at Brunswick Forest is a great way to meet new people and have fun with friends and family!